The global Internet of Things (IoT) in logistics market is anticipated to be driven by increase in cost pressure and rise in demand for automation of processes. The logistics industry has adopted IoT solutions at a slow pace than other industries. Hence, automation of business processes drives the Internet of Things (IoT) in logistics market. Furthermore, automation is happening in all industries, and the benefits are groundbreaking for enterprises, with higher productivity, better consumer awareness, and innovative business models. However, customers have to make substantial investments and experience high maintenance costs which are restraints of the market. The global IoT in logistics market is anticipated to reach US$ 63,728.6 Mn by 2026 at a CAGR of 12.4% during the forecast period. Logistics companies invest in automation to increase efficiency, speed, and optimization & timing of the services, thus increasing revenue and customer satisfaction. From a range of rapid high-tech evolutions and in a progressively digital environment where automationis affecting the entire industry, most of the board members of transport & logistics companies appreciate IoT solutions (tooptimize production,engage with customers, and operations) as key areas ofinvestment. IoT solutions are being implemented globally across all industries, and the benefits are huge for enterprises, for instance, greater consumer awareness, higher productivity, and innovative business models. In the current era of digital transformation, all industries are taking technological advantage by investing in IoT solutions for their input, processing, and output competences, throughout the business ecosystem. Growth in e-commerce and quick delivery of goods to attain competitive advantage has led to high demand for IoT solutions in the logistics market. Additionally, increase in the number of internet users along with rising popularity of social media platforms has contributed to the rise in awareness of IoTsolutions. The global Internet of Things (IoT) in logistics market has been segmented on the basis of software, hardware, organization size, application, and region. In terms of software, the market has been classified into traffic and fleet management, resource and energy monitoring, safety and security, and others. The hardware segment has been categorized into RFID tags, beacon, screen/display, and others. Organization size segment has been divided into small-mid-sized organizations and large sized organizations. Application segment has been classified into fleet, warehouse, freight, and yard/ dock. Regional segmentation comprises North America, Europe, Asia Pacific, Middle East & Africa, and South America. In terms of region, North America is projected to lead the global Internet of Things (IoT) in logistics market during the forecast period. Internet of Things requires active and flexible IT support, which is available in majority of companies of this region. North America dominates the global IoT in logistics market primarily due to increase in adoption of logistics solutions. The Asia Pacific IoT in logistics market is anticipated to grow at a rapid pace due to rising use of internet and increasing digitization. Furthermore, the market in Europe, Middle East & Africa, and South America is expected to witness strong growth during the forecast period. The global Internet of Things (IoT) in logistics market is largely driven by alliances between industry players. For instance, in October 2017, IBM acquired Vivant Digital, a Sydney-based, small boutique digital consultancy. The acquisition addressed growing need of customers looking for transformation though innovative business models and better customer experiences. Main players profiled in the report include Cisco Systems Inc., Octonion SA, Kaa IoT Technologies, LLC., NEC Corporation, Honeywell International, Novire Technologies, SAP SE, Intel Corporation, Oracle Corporation, Bosch Software Innovations GmbH, Rockwell Automation, Inc., BICS SA/NV, Amazon Web Services, International Business Machine (IBM) Corporation, and PTC Inc. 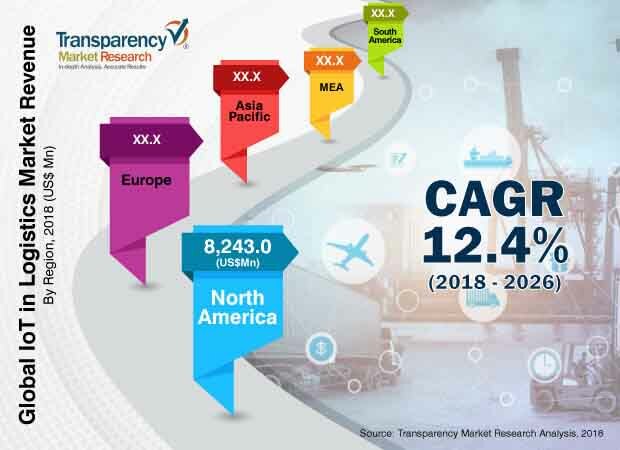 This report by Transparency Market Research analyzes and forecasts the data of the IoT in logistics market, at the global and regional levels. The report provides an analysis of the industry trends in each of the segments from 2016 to 2026, wherein 2018 to 2026 is the forecast period and 2017 is the base year. The global Internet of Things (IoT) in logistics market report provides an in-depth and accurate analysis of market revenue across the segments covered in the scope.It also highlights various drivers, restraints, and opportunities expected to influence market growth during the forecast period. The study provides a complete perspective about the IoT in logistics market and expansion throughout the research study in terms of value (US$ Mn) across North America, Asia Pacific, South America, Middle East & Africa, and Europe. Moreover, the study explains the penetration of each market segment within various regions and how these segments have accelerated the growth of the market. The overview section of the report analyzes market dynamics such as drivers, restraints, and opportunities that influence the current nature and future status of this market, key indicators, integration challenges, end-user adoption analysis, and trends of the market. A market attractiveness analysis for every segment has also been included in the report to provide a thorough understanding of the overall scenario in the IoT in logistics market. The report segments the market in terms of software, hardware, organization size, application, and region. In terms of software, the market has been classified into traffic and fleet management, resource and energy monitoring, safety and security, and others. The hardware segment has been categorized into RFID tags, beacon, screen/display, and others. Organization size segment has been divided into small-mid-sized organizations and large sized organizations. Application segment has been classified into fleet, warehouse, freight, and yard/ and dock. In terms of region, the market has been segmented into North America, Europe, Asia Pacific, Middle East & Africa, and South America.The report provides in-depth segment analysis of the global IoT in logistics market, thereby providing valuable insights at the macro as well as micro levels. This report provides all the essential information required to understand the key developments in the global IoT in logistics market and expansion trends of each segment and region. Additionally, the report provides insights related to trends and their impact on the regional market. Porter’s Five Forces Analysis provides analysis of bargaining power of suppliers, bargaining power of buyers, threat of substitutes, threat of new entrants, and degree of competition in theglobal IoT in logistics market. This study provides a comprehensive ecosystem analysis of the global IoT in logistics market. The research methodology is a combination of primary research, secondary research, and expert panel reviews. Secondary research sources such as annual reports, company websites, broker reports, financial reports, SEC filings and investor presentations, national government documents, internal and external proprietary databases, statistical databases, relevant patent and regulatory databases, market reports, government publications, statistical databases, World Bank database, and industry white papers are usuallyreferred. Primary research involves telephonic interviews, e-mail interactions, and face-to-face interviews for detailed and unbiased reviews on the global IoTin logistics market,across regions. Primary interviews are conducted on an ongoing basiswith industry expertsand participants in order to get the latest market insights and validate the existing data and analysis. Moreover, the data collected and analyzed from secondary and primary research is again discussed and examined by our expert panel. The research study includes profiles of leading companies operating in the global Internet of Things (IoT) in logistics market. Key players profiled in the report includeCisco Systems Inc., Octonion SA, Kaa IoT Technologies, LLC., NEC Corporation, Honeywell International, Novire Technologies, SAP SE, Intel Corporation, Oracle Corporation, Bosch Software Innovations GmbH, Rockwell Automation, Inc., BICS SA/NV, Amazon Web Services, International Business Machine (IBM) Corporation, and PTC Inc.